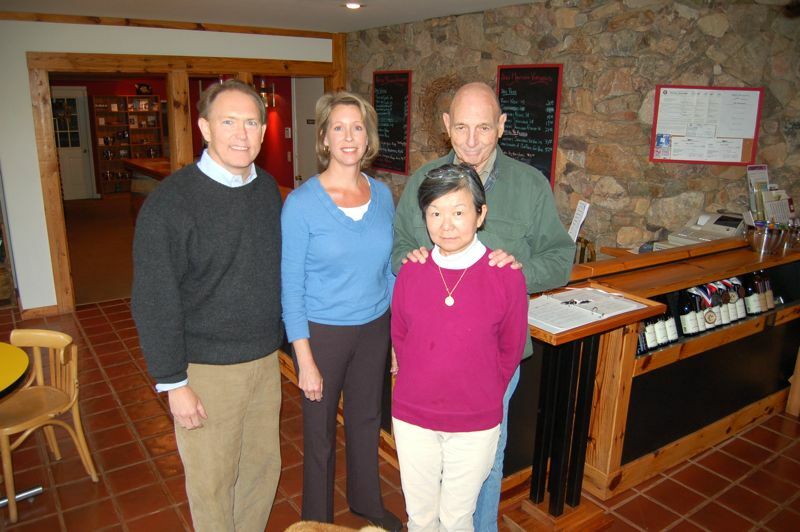 We took this photo back in late March of 2009 (left) New owners, Tony & Elizabeth Smith posed with Tom and Shinko Corpora who owned the Afton Vineyard & Winery since 1988. 2019 marks a decade Tony & Elizabeth have now owned Afton Mountain Vineyards. It’s been 10 years since Tony & Elizabeth Smith purchased Afton Mountain Vineyards. We first told you about them in this story back in March of 2009 as they were taking over ownership from Tom and Shinko Corpora. Over the past 10 years the Smiths have made many major improvements, including a covered pavilion back in 2011. Photo By Tommy Stafford : One special events of that evening was the sampling of some of the original wines from when AMV opened. Surprisingly a couple of them were still fairly good. Some others, not so much! April 6, 2019. Photo By Tommy Stafford : Damien (right) raises a glass in honor of the Smiths 10 years of ownership at Afton Mountain Vineyards. Friday – April 6, 2019. Though many improvements have been made at AMV during the past decade, the Smiths and Damien agree, they never want the vineyard and winery to lose its charm and sustainability. They pride themselves on using innovations like having goats trim excess grass around the property versus having to spray herbicides to keep things neat. Just one of the many things done at AMV. Happy 10th Tony & Elizabeth! Here’s to 10 more!